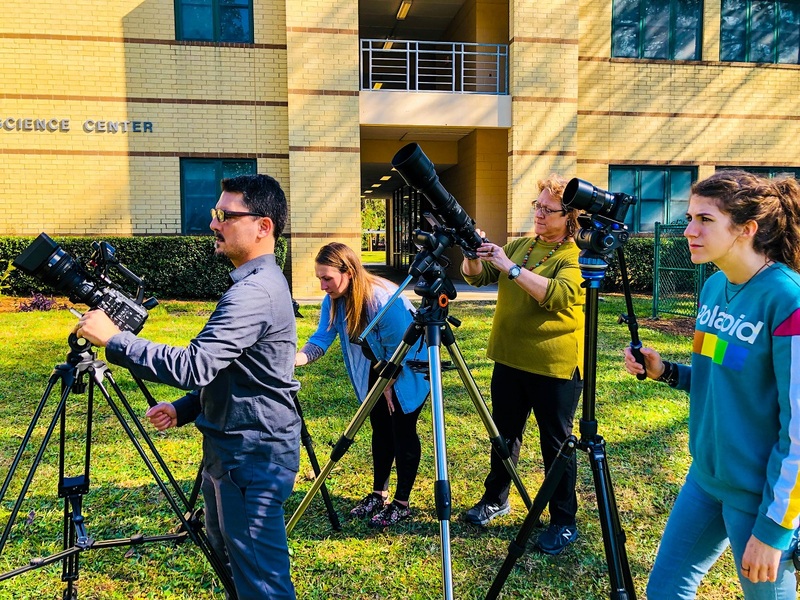 Sky watchers converged on Jacksonville University (JU) for a cosmic celebration on Sun., Jan. 20. 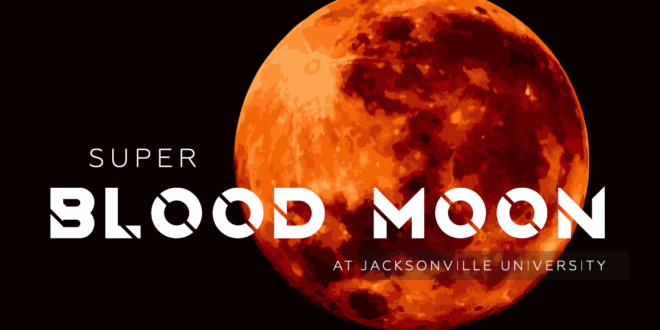 Co-hosted by the Northeast Florida Astronomical Society (NEFAS) and Jacksonville’s Museum of Science and History (MOSH), spectators peered at a super blood wolf moon. A night to remember in JU’s rooftop observatory. 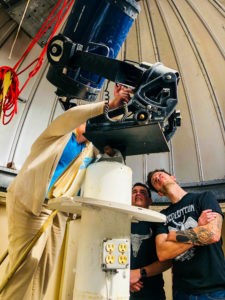 Guests enjoyed direct access to a dozen high-powered telescopes, JU professors, and local astronomy experts. The five-hour vigil included MOSH’s portable planetarium (STARLAB), educational talks, celestial object displays, and one thing all moon addicts crave: hot beverages. Some stayed an hour or two while most pulled an all-nighter. Interactive eclipse map available at www.timeanddate.com. JU Dolphins weren’t alone in their moonlight celebration. Across the globe, people rang in another year with several meteorological events. Exciting, right? Possibly spooky? Yes, but event-goers soon discovered that a super blood wolf moon isn’t as rare as you might expect. In fact, on average, it occurs once every three years, making it less apocalyptic than it may appear. super = when a full moon is at or near perigee (nearest point to Earth in its orbit). wolf = a moniker attached to any full moon in January. blood = a synonym that describes total lunar eclipses and refers to the reddish hue caused by scattered light in Earth’s atmosphere. Like a sunset. Translation? The sun, earth, and moon repositioned into a straight line. For about an hour. Meanwhile, the moon was as close to Earth as it could get. And as exciting as the science is, the real magic involved JU students. Dr. Brian Lane and Dr. Anthony Ouellette spearheaded the event on behalf of the University. Student participation was their priority. JU Camera Click Club members Savy Dobbs and Renee Franklin with JU Professors at Reid Science Center. Sergio Aponte, Courtney Purcell, and Alvero Sanchez served as “shepherds” for the big event, guiding guests to and from the rooftop observatory. JU students also attended a dry-run last Thursday night to set up equipment and practice moon tracking and time-lapse photography. Kenneth Huffman and Savy Dobbs were among them. Besides the cameras and tripods dotting the roof of the Howard building, smartphone adapters were in high demand. Specialized for use with telescopes, the adapters were made available to guests by NEFAS. Capturing high-resolution images beyond our skies was never so easy. Huffman, double-major in Mechanical Engineering and Engineering Physics, lent his expertise, too. Originally from a small town in Oklahoma, he first arrived on campus in 2015. In addition to his course work, he serves as secretary for the JU Society of Physics Students. JU student Kenneth Huffman (on right) and others prepare for Jan. 20 event inside JU’s Observatory. Huffman was selected to host an Instagram takeover for the University, creating a story unique to the student perspective. “I became involved by just enjoying physics and wanting to learn more,” he said about his role. “Becoming more involved can open up many opportunities—like getting to play with a telescope during a blood moon or landing a forensic engineering internship.” Both experiences, Huffman said, have been invaluable to him as a student, and he hopes to continue with the firm where he currently interns. WJCT 89.9 also joined the midnight fun. Above and Beyond, a 90-second weekly astronomy program produced by MOSH and JU’s The Science Of… aired for the first time on Jan. 18. The show included talk of blood moons and other fascinating science-related topics. To recapture the watch party fun, visit www.ju.edu/bloodmoon, where the sky may or may not be the limit.